Welcome to Volume 3 of Kids’ Quest Catechism Club. Using biblical accounts of God’s work in the world to help the children understand God’s character and other abstract theological truths, this volume covers Questions 109–150 in First Catechism. Music, games, art, written activities and a lot of repetition reinforce teaching and help children memorize answers to the questions. Volume 3 is divided into three units. The first unit, questions 109–125, is a study of the Lord’s Prayer. As children learn the meaning of each of the six petitions in the Lord’s Prayer, they also learn that God wants his children to pray and promises to answer our prayers. In the second unit, questions 126–140, children learn about the two sacraments--baptism and the Lord’s Supper. Christ gave these to help us understand God’s covenant promises, and the Holy Spirit works through them to nourish us with God’s grace. As children memorize the answers to the questions in the third unit, 141–150, they learn about death, hell, and everlasting punishment for unbelievers. The focus, however, is not on these dark subjects, but on God’s ultimate fulfillment of his promise of salvation to his people. Having learned early in Kids’ Quest that sin messed up God’s perfect world and corrupted his image in mankind, children now learn that when Christ returns, he will defeat Satan and death, and make God’s world and the image of God in his people perfect again. In God’s perfect kingdom, there will be no sin. Everyone will be holy and happy, as Adam and Eve were in the Garden of Eden. Throughout this final volume, challenge the children toward the goal of reciting the answers to the entire catechism at one sitting. Help children by reviewing at each meeting and by scheduling two Super Saturday review sessions (see Lesson 2). Work with your church’s Kids’ Quest director to reward children who achieve this goal with a Bible or other appropriate recognition at a service in which parents and the entire congregation participate. Look ahead to Lesson 12, which celebrates the children’s completion ofKids’ Quest and learning wonderful biblical truths. Make it a special meeting with decorations, refreshments, and small prizes. Every child will receive a certificate of completion. Consider also giving each one an award, which may range from a bookmark to a Kids’ Quest CD, or something in between. 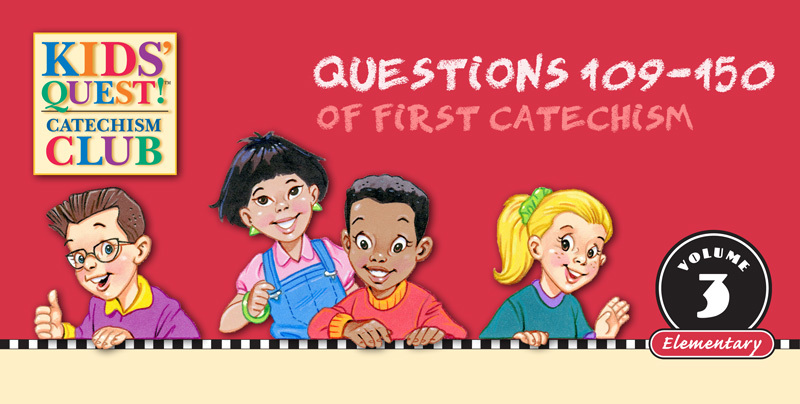 Welcome to Volume 3 of Kids' Quest Catechism Club.